Luxury holiday cottage rated by Gîtes de France as 4 épis ("stars"). Fully equipped with free secure private parking (garaged for motorcycles). Each cottage has two bedrooms; stylish bathroom and spacious lounge diner plus outside terrace with BarBQ. Beautiful spring water infinity pool for guests with shaded sun terrace. And, within a few steps of your gîte or the swimming pool, superb fishing from our private pontoons plus; plus mooring for small boats. Complimentary Wi-Fi throughout. Supermarket 300 metres. The Lot et Garonne department is the garden of France with fresh fruit and vegetables grown throughout. Famous for plums and prunes, Lot et Garonne is where the French come on holiday; it's a real and authentic area which has all the charm and attractions for visitors and yet is not "touristy". Having said that, the popular attractions in the Dordogne are just 35 minutes away. The river Lot is a large and impressive river, which although popular for boating and fishing, is still unspoilt. You can hire a boat and spend hours without seeing other boats! It's quiet and peaceful and yet Clairac is within 300 meters of local shops and within 10 minutes of a hypermarket in Tonneins. All in all, it's the perfect family holiday. However, don't take our word for it; read some of our reviews! N.B. PLEASE ENQUIRE FOR AVAILABILITY AS WE HAVE TWO GÎTES. Following a busy career in banking and project management with frequent international travel, John decided that he would love to follow his dream of settling in southern France on the banks of a beautiful river. After many years living in sunny Cyprus, Chrissie didn't need much encouragement to make the move! Their joint interest in welcoming and meeting people made the gîte opportunity the perfect choice; especially as Chrissie has worked in hospitality and marketing for many years. Electric radiators are available for use as required. However, in cooler months, where electric radiators and / or the open fire is required a small charge of €10 per day is charged. Linen is provided and changed each week. A laundry room is available for use by guests. Each gîte has an open fireplace where, in cooler weather, logs will be provided. Free, enclosed and secure parking is available. For motorcycles, there is a locked garage. Complimentary Wi-Fi is available within each gîte; and the pool area. Fishing boats are available free of charge to our guests. A large spring water fed infinity pool is available. The river Lot is a beautiful river in its own right but, for fishermen, it is a wonderful experience because large fish abound; carp to 60lbs with huge pike and catfish. Either fish from the fishing pontoons at Les Séchoirs or take a fishing boat upstream. Horse riding stables are close to the village as are cycling paths and hiking trails (Grande Randonnées). Every bit as impressive as the photos and more! The views of the river from the bedrooms were wonderful and from the infinity pool even better. We in Les Tabacs and the extra living space more than made up for the short walk round to the riverside deck; the styling touches were just enough to make it special without becoming kitsch. Everything was clean and well-maintained and well-equipped. Our hosts, John and Chrissie, could not have been more welcoming and full of helpful knowledge and tips to make the most of enjoying the area. The local supermarket was a pleasant few minutes walk away along the riverside and stocked everything we needed so self-catering could not have been easier. Beyond Clairac, we explored several of the bastide villages and a trip to Chateau Bonaguil was a real hit with our teenage daughters ("It's Narnia!"). Only the pleasure of lazing in and by the pool prevented us from enjoying more of what the area had to offer. Overall, the best two weeks of holiday we have had in years. Thank you for your lovely review and we are delighted that you and your daughters enjoyed your time with us so much. We hope to see you again; perhaps in Les Pêcheurs next time! 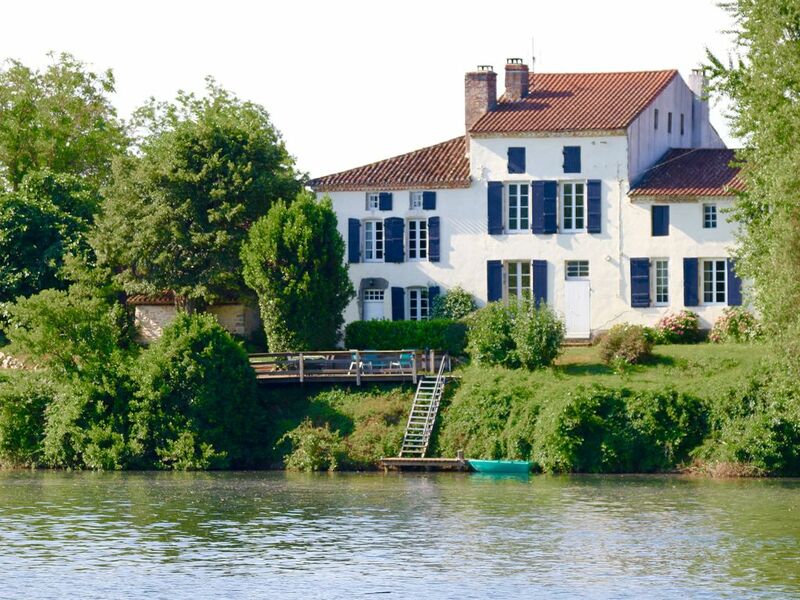 Les Séchoirs was once a tobacco farm which has been beautifully restored to provide luxury sell catering family accommodation on the banks of the river Lot. Here you can fish for specimen carp, catfish, pike, perch etc or boat up the river enjoying the wildlife and beauty of this special part of France. With the village providing shopping, restaurants and bars just 5 minutes easy walk, there's no need to drive everywhere. Les Séchoirs is perfectly located for trips into the Dordogne; visits to vineyards with wine tasting; cycling routes; walking, horse riding, swimming, boating; plus river fishing with sizeable carp, pike and catfish!